The Américas Awards: honorable mention and commended picture books. Part 2 in this series on award-winning books. New Book Alert: The Girl Who Drank the Moon. Arriving Aug. 9th, this new novel from Kelly Barnhill is an incredible and immersive new fantasy story. Find and Share Diverse Children's Books. There is always a #diversekidlit hop running - please join to share and promote diverse books. Kid Lit Blog Hop for July. This monthly hop features posts on all aspects of Kid Lit including those by bloggers, authors, and more. 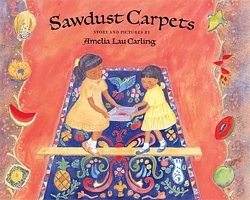 Sawdust Carpets (2005) by Amelia Lau Carling (also available in Spanish). This book shares about the Holy Week tradition of creating temporary carpets out of sawdust on the streets in Antigua, Guatemala. The story is told in semi-autobiographical fashion through the eyes of a young Chinese-Guatemalan girl as she and her family travel to Antigua for the celebrations. An author's note at the beginning and a glossary at the end add additional information about these traditions. A neat addition to any collection of holiday-themed picture books! 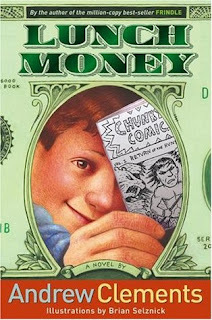 Lunch Money (2005) by Andrew Clements. I received this book as an end-of-year gift from one of my third graders who said that it was her favorite book ever. I have a basket of Andrew Clements books in our classroom library and use Frindle for book club discussions, but this was one I had not yet read. It was ... ok. Main character Greg is obsessed with money, profits, and making more money, but when his entrepreneurial habits get him in trouble at school, he has to get even more creative. There are some of the same social justice / kid-power types of moves as in Frindle, but the characters and situations just didn't grab me in the same way. 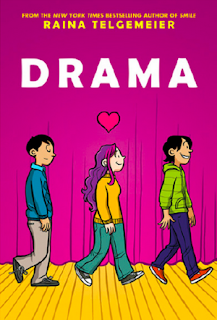 Drama (2012) by Raina Telgemeier. This realistic-fiction graphic novel focuses on seventh-grader Cassie, and the drama of the title refers both to her interests in theater set design as well as the kinds of drama one expects in middle school - issues with friends and relationships. Drama has made the ALA's 2014 list of the Top 10 Most-Challenged Books in the US because of its inclusion of gay characters and relationships. I am delighted to have a signed copy of this book to add to my classroom library (thank you, #nErDcampMI!). 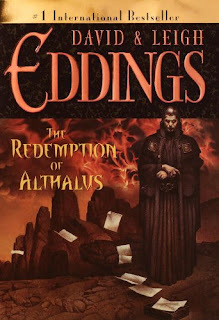 The Redemption of Althalus (2000) by David and Leigh Eddings. I somehow missed the Eddings' Belgariad and Mallorean series as a kid but was encouraged to read them a few years back as a kid. They are incredibly entertaining and enjoyable, with impressive world-building. The Redemption of Althalus is a stand-alone novel but shares many of those same traits. The characters and dialogue are engaging and often quite humorous, though I empathize with GoodReads reviews complaints about the length (800 pages) and the seeming inevitability of the action sequences. Thanks, Jane. I had to bug a LOT of kids to figure out where my copies of Smile and Sisters ended up at the end of last school year, but they eventually all returned home. Sawdust Carpets sounds fascinating. I will definitely need to look for it. Google pictures of the actual carpets too - they are incredible! Thanks for each of these, Katie. Sawdust Carpet sounds fascinating, something new to learn about! I still need to catch up with Raina Telgemeier, and read Drama. I enjoyed the earlier ones a lot. Drama is a very sweet story and captures so much about the stressors of middle school. Anything by Raina Telgemeier is a hit in our school library! I agree with Linda that Sawdust Carpet sounds fascinating! It is! There are some incredible pictures online of the sawdust carpets too. Drama is so wonderful. Sawdust Carpets is a new title to me. I will definitely look for it. Andrew Clements is great. I don't think I've read that one though. Thanks! I think you will enjoy Sawdust Carpets!